If you’re regularly dealing with large collections of images, you’re probably aware by now of the importance of reducing their size. Resizing images is beneficial because it helps you free up disk space and because it makes them considerably easier to share. Moreover, image size is directly linked to the loading speed of your website or blog. That’s why it’s recommended not to upload large files, so that visitors can benefit from a pleasant user experience. The built-in Preview app can be a good place to start if you want to optimize your images. 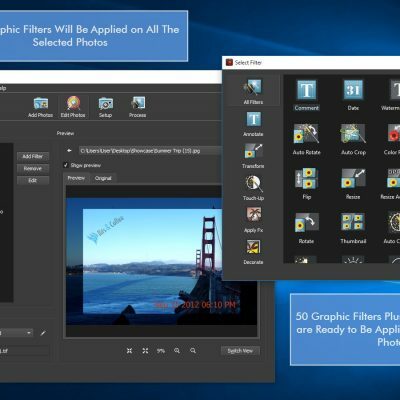 The app is more than a basic default photo viewer and allows you to perform various edits, including resizing multiple images at the same time. Before starting, make sure that all your pictures are stored in the same folder. Next select all of them and open them in the Preview app. In the newly-opened window, go to Edit in the menu bar and Select All. Now, with all the images selected, go to Tools in the same menu bar and then Adjust Size. The app gives you the option to select one of the preset resolutions or to manually type in the preferred size for Width or Height. Once you’ve entered the desired measurements, all that’s left to do is to save your files. 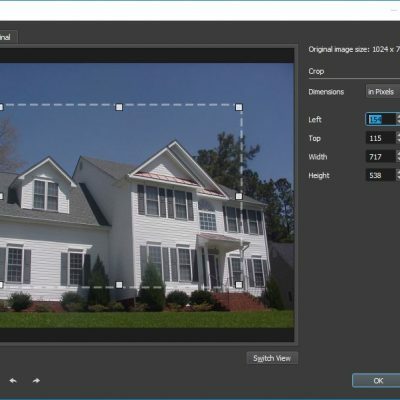 Besides resizing, the Preview app lets you perform other optimization-related operations, such as converting to another image format, rotating or flipping groups of images. 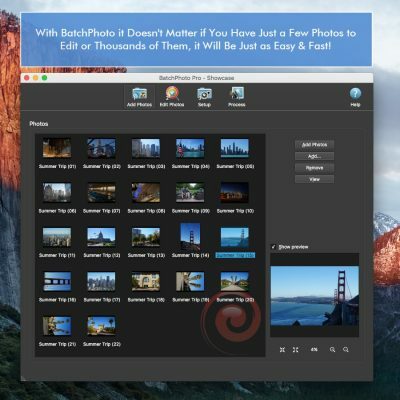 BatchPhoto is an easy-to-use app to resize images in bulk on Mac. All you have to do is follow a simple, three-step wizard: add your photos, apply the desired edits and choose your output folder. The app allows you to change the size of your photos by entering the desired dimensions for width and height expressed in either pixels or percentages and offers a preview tab so you can see how your shrunken image will look. BatchPhoto focuses on improving users’ productivity and that’s why it comes with the option of saving your settings as profiles and loading them later, in another session. Another feature worth mentioning is the Folder Watch, particularly useful if you’re working constantly with new images and need to reduce their size. This feature makes your job so much easier, because it monitors certain folders for newly-added images and automatically applies a set of edits which you previously defined. 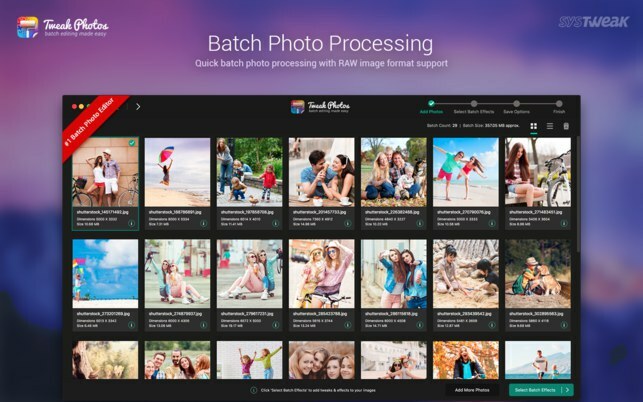 If you need to further optimize your photos, BatchPhoto offers plenty of options. You can convert, auto crop and rotate, watermark, date stamp or rename multiple pictures at once. The app also provides options to retouch your images by adjusting the brightness, contrast or saturation or by sharpening them. Additionally you can apply special effects to your pictures, like sepia and black and white and add borders and frames. 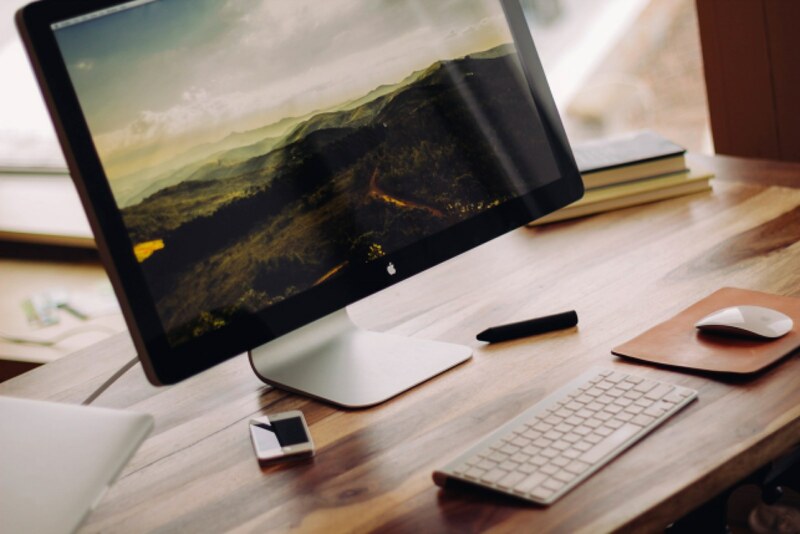 If you don’t feel the need to install another app on your Mac, PhotoSize is the right solution. This is a free online tool which you can use to resize more images at the same time. The process is quite simple and structured in three steps: add your images, apply the Resize filter and last choose your image format and destination folder. The Resize filter gives you the possibility to choose from a wide range of presets, including Full HD quality, or to manually enter the desired values for width and height. PhotoSize lets you upload and export to same of the most popular image formats like JPEG, TIFF, PNG, PSD or GIF. In addition to resizing and converting, you can also crop, rotate or retouch your photos in bulk. 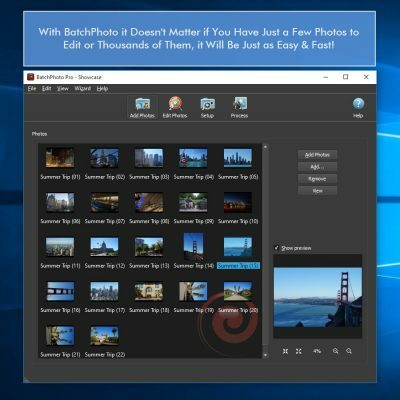 EasyBatchPhoto is a straightforward app designed to help you optimize your images. The interface is user-friendly and makes it quite easy to navigate through the available options. 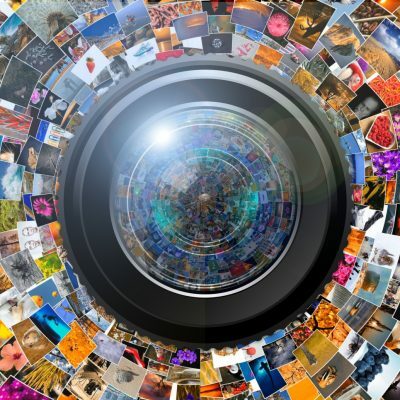 The ease of use, along with the capacity to process hundreds of images at once, are the main benefits of this app. In terms of editing, you can automate plenty of repetitive operations such as resizing, converting, cropping, rotating or watermarking. Pretty useful is the option to create templates for certain tasks and to export/import them. This way you’ll be able to increase your efficiency and use the time gained to focus on other projects. 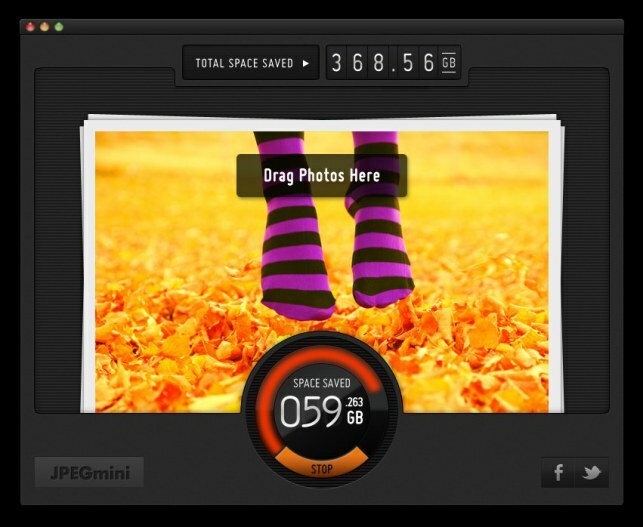 If you need to considerably reduce the size of your files from let’s say 10 GB to 5 GB, without losing quality, JPEGmini is the tool to try. How does it work? Well, basically the app can compress file size by removing any unnecessary binary information from your photos when you export them. JPEGmini is focused on automation, so it doesn’t leave room for the user to take control. 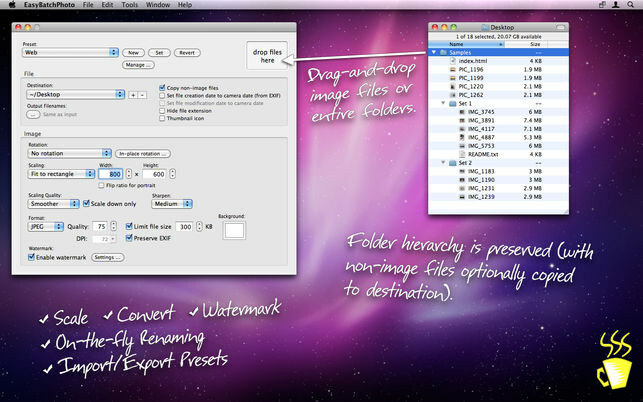 All you have to do is drag and drop your images and allow the optimization process to begin. The only thing you can choose is whether to overwrite the original pictures or export the processed ones in another folder. You can also change the resolution of your photos, by selecting from a couple of predefined templates for width and height. It’s important to specify that the tool works only on JPEG’s, which means you can’t add RAW, PNG or TIFF files. JPEGmini is available as a standalone app, but also comes as a plugin for Lightroom and Photoshop extension. 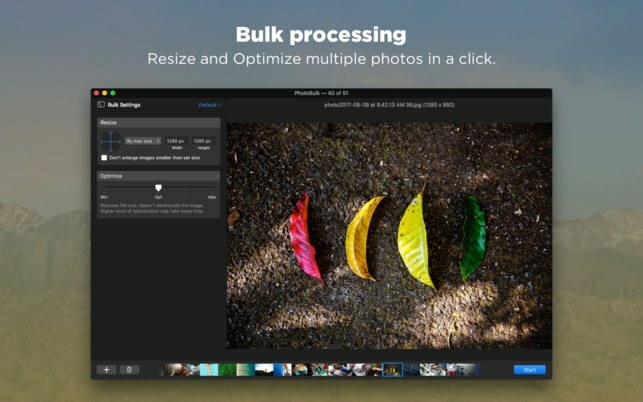 PhotoBulk is a Mac app which you can efficiently put to use to reduce the size of your images. The app comes with a simply designed interface, split in two main columns: on the left side you select the desired operation, while on the right side you can make the necessary adjustments to that operation. A live preview is available, as well as the possibility to save your settings as presets. With PhotoBulk you benefit from multiple resizing options. You can choose from preset dimensions, enter the new dimensions in the box or perhaps resize by percentage. If you wish to save disk space, you can also optimize the file size of your JPEG or PNG files without altering the resolution or quality. The app places at your disposal options to add a watermark to your photos, as well as rename and convert them. 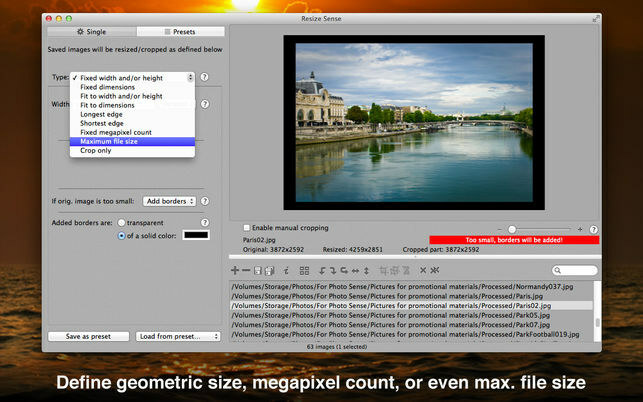 Resize Sense is a simple and straightforward photo resizer for Mac. 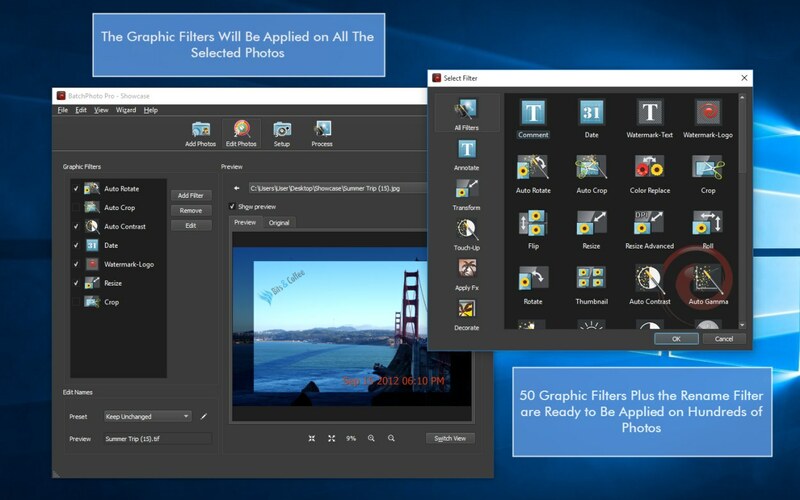 It’s designed to help users simplify their work by adjusting images to the right size for social networks, email or various graphic design projects, in bulk. 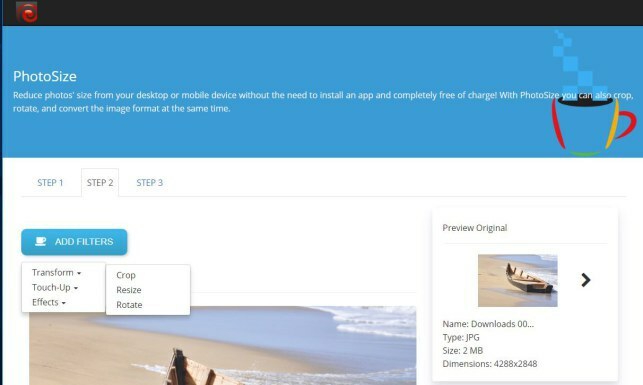 The app offers numerous alternatives to resize your photos: by selecting fixed dimensions, to fit to width and/or height, by the longest or shortest edge, by setting the maximum file size or by only cropping, which lets you crop and straighten your images using a predefined aspect ratio. Resize Sense allows you to build your own presets and easily apply them later to a new batch of images. Further options include flipping, rotating and renaming pictures, as well as editing the IPTC and EXIF metadata. 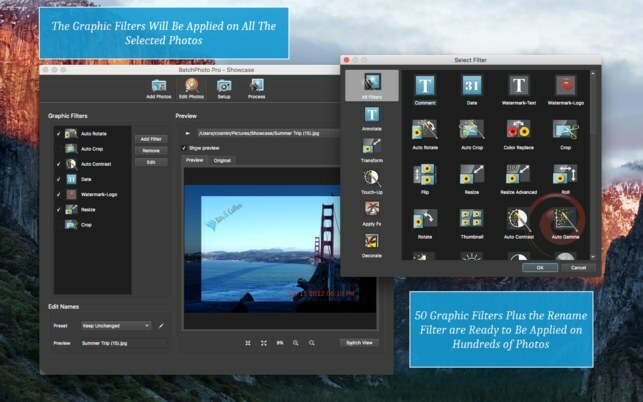 Tweak Photos is a batch editing app that offers plenty of features to optimize and enhance your images. The app is simple to use thanks to the intuitive layout and breaks it all down in easy-to-follow steps: add photos, apply the desired effects and select your Save options. With Tweak Photos you can easily resize your photos in pixels or percentages and auto-correct the orientation based on the EXIF metadata. The app also allows you to crop, rotate and watermark your pictures, as well as enhance them by reducing the noise or adjusting things like brightness and contrast. To improve your workflow you can save your settings for later use. 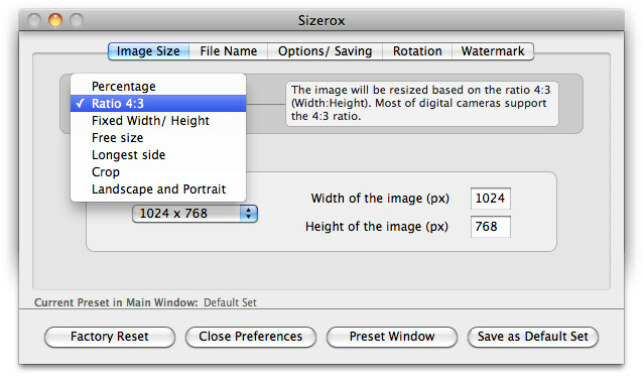 If you’re looking for a simple app to reduce photo size on your Mac, Sizerox is definitely worth a look. This app may not have the sleekest design and may not offer the same multitude of editing options as other ones, but it makes up for it through ease of use and its batch ability. You can change the image size by percentage, ratio, fixed width and height, longest slide and more, the options are numerous. Additionally you can perform other edits, such as rotate, crop or rename. You can also protect your photos by adding a customizable text or logo watermark. 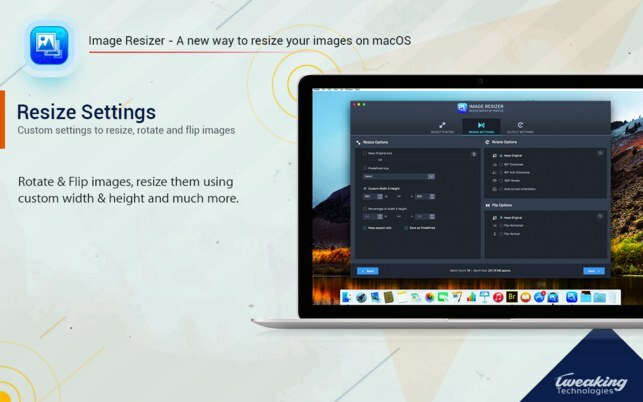 Image Resizer is our final proposal for reducing the size of your pictures on Mac. This app is pretty basic and doesn’t offer too many options, but it gets the job done efficiently when it comes to changing photo size. You have the possibility to resize images by custom width and height, rotate, crop and flip them, as well as convert them to different formats. Which image resizer app for Mac do you use? Let us know in the comments below.